Egyptian Chronicles: Regarding Morsi and the conquest of Tehran 2012 !! Regarding Morsi and the conquest of Tehran 2012 !! Nevertheless the brothers in the Gulf as well the brothers in the Muslim brotherhood and Salafist movement in Egypt and Arab worldwide have turned the 42 minutes speech in to the greatest victory over the Persian Empire since 1400 years and beyond !! Unfortunately the overreaction of the Islamists in Egypt after the speech whether online and offline stunned many revolutionary Egyptians with its sectarian nature including me. The MB and Al Nour Party ordered their members to receive Morsi in the airport and then head to his house in order to salute him. Now Morsi is being hailed as the New Saladin of modern time because the radical sectarian Islamists believe that he slammed the Shiite in their own land thanks to the few words he said in his speech. Radical Shiites do not recognize Abu Bakr , Omar and Othman as the rightful to rule after Prophet Mohamed “PBUH” and some of them hate and insult them in some of their rituals. Thanks to very trusted diplomatic sources I knew that the ministry of foreign affairs is not responsible for this speech so this speech is made and written in presidency. Some say that that Morsi that Caliphs’ phrase to his speech while reading in order to slam Ali Khamenei as the later ignored the first 3 Caliphs and spoke about chosen caliph Ali. I can not describe how the radical Salafist and Sunni in the Gulf received that sentence in why you can not imagine it , here is a collection of what I saw last night and depressed me. What Morsi did in Tehran to Omar was important than what 1000 TV series like Omar can do for him !? This status was copied all over the FB and twitter madly. We are speaking about Omar Ibn El Khateb , the second Caliph in Islam who was assassinated by Pirouz Nahavandi aka Abu Lula , the Persian because of the Muslim conquest of Persia. Nahavandi got an alleged Shrine in Kashan that was built in time of the Sunni Khwarazmian dynasty. That Shrine was already closed thanks to the International organization of Islamic scholars “headed by MB veteran Sheikh Karadawy” in 2007 in an attempt to have a dialogue between Sunni and Shiite. To be honest some historians believe that it is not a shrine for Omar’s assassin but rather to a some Sufi Sheikh as it was built during the rule of the Khwarazian dynasty that was a Sunni ruling family. Also according to historical account Omar’s assassin was executed in Madina after his horrible crime and was buried there. Arabs do not have tombstones in Arabia and it does not make sense on how his body would be transferred from Madina to Iran during that time. There is a huge historical gap when it comes about the reality of that shrine yet I can not deny that there are radical Shiites who got very hateful views about Omar , Aisha and Abu Bakr as well Othman “Peace upon them all”. Morsi avenged for Omar from the Zoroastrians !!! I do not think that a great man like Omar needs a man like Morsi to restore back his right. Already the radical Shiite will not stop their hate or insult to him or lady Aisha or Abu Bakr after what Morsi said. Anyhow It did not stop at tweets, statements and Facebook status , we got the blessings of the radical Sheikhs in the Gulf who crowned Morsi who is struggling to control Egypt and to solve its problems in the first 100 days as the leader of the Nation. we got even fake quotes for celebs that celebrate the huge victory in most of the Muslim brotherhood pages. 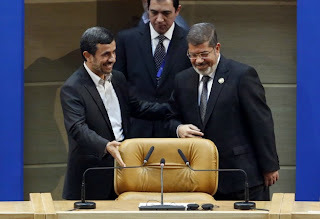 Erdogan : Morsi is the first Muslim Arab Egyptian to slam the Iranian regime at the their household since the fall of the Othman Empire in this incredible way. Egypt is a giant that no one will stand against anymore !! No way could Erdogan say this or any prime minister or any real politician say this ! !Ironically this is not the first time the Muslim brotherhood FB in Egypt post fake quotes of Erdogan about how great Morsi is !! Famous political sciences professor and TV host Moatez Abdel Fatah denied that he praised the rallies supporting Morsi in Cairo because he championed Abu Bakr and Omar in the home of those who curse them !! Welcome to the new Islamic world , no wonder we suffer a lot. To be honest I do not know if Morsi wants to send a message to the Gulf state that we will be in their side or he wants balanced relations with Iran and the Gulf. You do not start a new chapter with a country like Iran in a very critical time by igniting sectarian differences. The Muslim brotherhood media and icons used to defend this visit to Iran as a sign of independence from the American fellowship and that the Egyptian Iranian relations are good for our Egyptian economy. 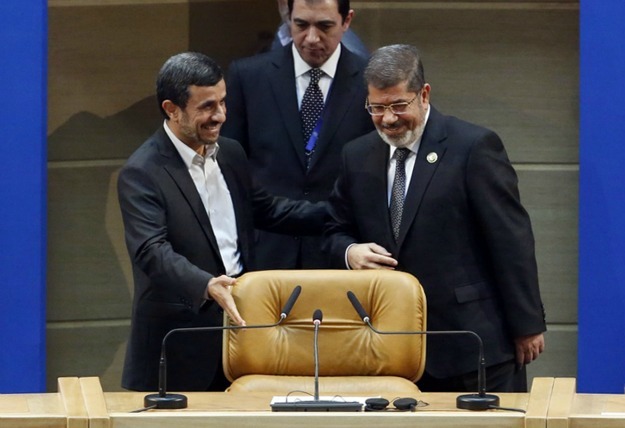 Already after that summit Morsi held talks with Ahmadinejad to discuss the bilateral relations and its future. Now we got leaks to the media that we are going to re-open our embassy in Tehran and that we are going to welcome Iranian Shiite pilgrims to visit the Holy Shrines of Ahl Al-Bayt !!!! As you can the scene is contradictory if you pay attention for news for real. Morsi’s adviser journalist and Ayman Sayyad also criticized how the speech was received in a sectarian way. Unfortunately the problem of some Muslims that causes their division is that they still live in the 1th century AH and their enemies drag them to this. It is worth to mention that others did not like this sectarian of the speech, after all it is a NAM summit and not the Islamic Conference Organization summit. Yesterday I feared that the speech of Morsi and those few words he said in Tehran would be just an introduction to a war between the Sunni and Shiite. I do not want my country and its army to be dragged to a sectarian regional war by its president and his party as simple as that. Already there are educated people in Egypt who believed that there are mass-executions taken place in Iraq for all those named Omar !! Egypt after the revolution should work on uniting the Arab world and Islamic world peacefully. okay u r saying that Islamic ppl r making a big deal of that speech n u do the same by ur reaction ohhh the irony!! why do u think that "just" a speech will lead to a war between Muslim sunni and shiite??!! c'mon stop overreacting like this ,be objective!! of course this speech is not leading to war...The comment is relating to the wider issues in the region. Let's wait and see how his speech in the US will be. This will be the real measure of Morsi's foreign policy. A speech in any other country is irrelevant since the reaction will not exceed some negative remarks. Morsi needs the US money and he needs to get some recognition and legitimacy outside Egypt. Therefore his speech in the USA will be one of obedience and seduction.